This is an evergreen hot topic, people around the world keep searching for the latest best streaming app. The streaming industry has exponential growth in the past 4 years. Based on the user request, we decided to put an updated article on the best 3 streaming app. We had scouted more than 15 apps, and we conclude the following are the best streaming apps. All these apps are the official app. So you need to pay a minimum dollar, to enjoy their premium service. Before entering to the article, let us know what is streaming? How streaming works?. In simple terms, paying a media file continuously as a stream is called streaming. Here the data are sent as a compressed file via internet. And the receiver uses a codec or any decoding script to play the file via default player like flash player. It may use basic HTTP, TCP/IP, and HTML Protocols. It gives a lot of advantages to the user like the media is directly playing from the server so it doesn’t occupy any space in the user device. And you perform all functions like forwarding, rewind, increase and decrease the speed. Understanding how streaming works helps the user to fix the basic streaming issue. Buffer memory plays a vital role in streaming. The buffer memory is the place where the incoming streaming packets will be stored. And the packets are retrieved and decoded to play via the media player. And while playing these data, the next set of packets will be downloaded and decoded to play. This is a cyclic process. It continues till the end of the media. Depending on the bandwidth the buffering speed may vary. Now most of us are using the high-speed internet, so most of the streaming is buffer-less. Now you know the basic concepts of streaming, let’s proceed to the core article. 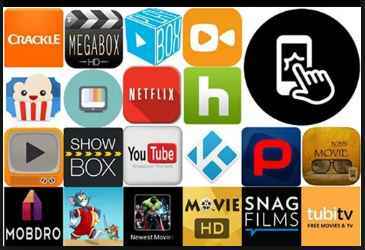 The following are the best streaming apps of all time. When it comes to the streaming, Netflix is the unbeatable champion. Netflix is the largest streaming service, provider. It was started as a rent a movie by mail services. Now it has consumed streaming industry. At the beginning , they were streaming movies and TV shows. Now they shifted to original series. Netflix is the largest provider of original series. And large number of subscribers are paying for their premium services to their series. The cost is about 8$ for single screen. After the exponential growth of Netflix over the streaming industry, HBO, Starz, and showtime are opting for this method. Netflix provides support through various platform and device. You can watch Netflix on Android app, ios, web browser, smart TV, Playstation, Xbox, Chromcast, Firestick, Roku and most of the streaming devices. Amazon video is a yet another initiative by Amazon to rule the streaming industry. Increasing demand for the web series and original streaming, Amazon had made similar steps. To promote this service, they had used Amazon prime membership. Starting from a fast delivery membership, amazon prime has progressed a long way up. It also provides some of its original contents which rivals the best of Netflix. And the cost is around 9$ per month and 99$ a year. With this subscription, you can watch TV shows, movies, and Amazon-exclusive contents. In addition to this, they also provide 2-day free shipping. This is am entertainment power pack. Since Netflix and Amazon are mainly concentrating on streaming rights over their contents. There is a possibility they might release as a DVD. Hulu is mainly focusing on bringing the television contents. It does not stream the content or series fully. Rather, Hulu is streaming some of its episodes. Hulu is mainly focusing on the contents of HBO, Showtime, and Cinemax. It also has some of its original series. The other category includes movies, live TV, and Hulu exclusive. The cost is around 8$ and 40$(with Live TV). The content is not as good as Netflix or Amazon. But the users are switching to Hulu for HBO and showtime contents. It also provides support for various devices like android, ios, amazon firestick, chromecast, Roku and much more. These are the Best official streaming apps 2018. We highly suggest you go for Netflix. Since the cost is similar, the service is much better on Netflix. Hereby we conclude this article. Hope you enjoyed this article.